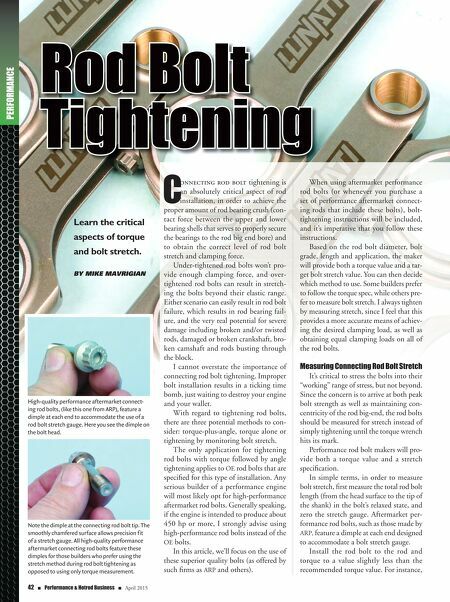 42 n Performance & Hotrod Business n April 2015 PERFORMANCE C onnecting rod bolt tightening is an absolutely critical aspect of rod installation, in order to achieve the proper amount of rod bearing crush (con- tact force between the upper and lower bearing shells that serves to properly secure the bearings to the rod big end bore) and to obtain the correct level of rod bolt stretch and clamping force. Under-tightened rod bolts won't pro- vide enough clamping force, and over- tightened rod bolts can result in stretch- ing the bolts beyond their elastic range. Either scenario can easily result in rod bolt failure, which results in rod bearing fail- ure, and the very real potential for severe damage including broken and/or twisted rods, damaged or broken crankshaft, bro- ken camshaft and rods busting through the block. I cannot overstate the importance of connecting rod bolt tightening. Improper bolt installation results in a ticking time bomb, just waiting to destroy your engine and your wallet. With regard to tightening rod bolts, there are three potential methods to con- sider: torque-plus-angle, torque alone or tightening by monitoring bolt stretch. The only application for tightening rod bolts with torque followed by angle tightening applies to OE rod bolts that are specified for this type of installation. Any serious builder of a performance engine will most likely opt for high-performance aftermarket rod bolts. Generally speaking, if the engine is intended to produce about 450 hp or more, I strongly advise using high-performance rod bolts instead of the OE bolts. 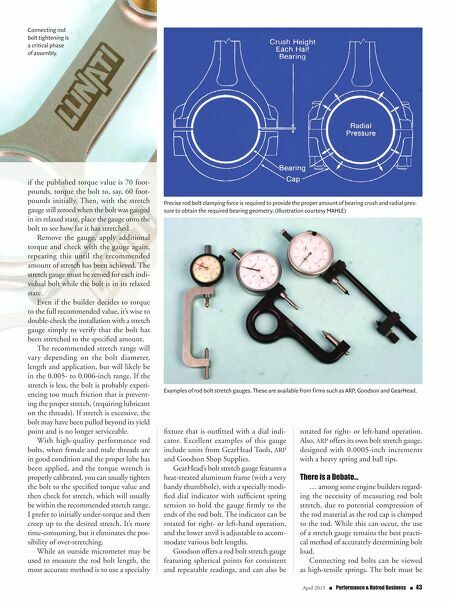 In this article, we'll focus on the use of these superior quality bolts (as offered by such firms as ARP and others). When using aftermarket performance rod bolts (or whenever you purchase a set of performance aftermarket connect- ing rods that include these bolts), bolt- tightening instructions will be included, and it's imperative that you follow these instructions. Based on the rod bolt diameter, bolt grade, length and application, the maker will provide both a torque value and a tar- get bolt stretch value. You can then decide which method to use. Some builders prefer to follow the torque spec, while others pre- fer to measure bolt stretch. I always tighten by measuring stretch, since I feel that this provides a more accurate means of achiev- ing the desired clamping load, as well as obtaining equal clamping loads on all of the rod bolts. Measuring Connecting Rod Bolt Stretch It's critical to stress the bolts into their "working" range of stress, but not beyond. Since the concern is to arrive at both peak bolt strength as well as maintaining con- centricity of the rod big-end, the rod bolts should be measured for stretch instead of simply tightening until the torque wrench hits its mark. Performance rod bolt makers will pro- vide both a torque value and a stretch specification. In simple terms, in order to measure bolt stretch, first measure the total rod bolt length (from the head surface to the tip of the shank) in the bolt's relaxed state, and zero the stretch gauge. Aftermarket per- formance rod bolts, such as those made by ARP, feature a dimple at each end designed to accommodate a bolt stretch gauge. Install the rod bolt to the rod and torque to a value slightly less than the recommended torque value. For instance, Rod Bolt Tightening Learn the critical aspects of torque and bolt stretch. By Mike Mavrigian High-quality performance aftermarket connect- ing rod bolts, (like this one from ARP), feature a dimple at each end to accommodate the use of a rod bolt stretch gauge. Here you see the dimple on the bolt head. Note the dimple at the connecting rod bolt tip. The smoothly chamfered surface allows precision fit of a stretch gauge. All high-quality performance aftermarket connecting rod bolts feature these dimples for those builders who prefer using the stretch method during rod bolt tightening as opposed to using only torque measurement.